The Black Swan Nickel Project is located 53 km NNE of Kalgoorlie in Western Australia, within the Archaean Eastern Goldfields Province. Exposure is generally poor with salt lakes and lateritised residual and transported soils covering much of the region. Nickel sulphide mineralisation at Black Swan is hosted by the Black Swan Komatiite Complex, a 3.5 km long by 0.6 km thick lens of olivine cumulate and spinifex-textured komatiite flows. The northern and southern tails of the complex thin and terminate rapidly in a complex series of interdigitating felsic and komatiite horizons. The Black Swan Complex contains two major phases of Kambalda style mineralisation. The first was a series of thin komatiite flows at the base of which formed the Silver Swan massive sulphide mineralisation. Subsequent to that a much thicker flow formed over the top of this hosting the Black Swan disseminated mineralisation. 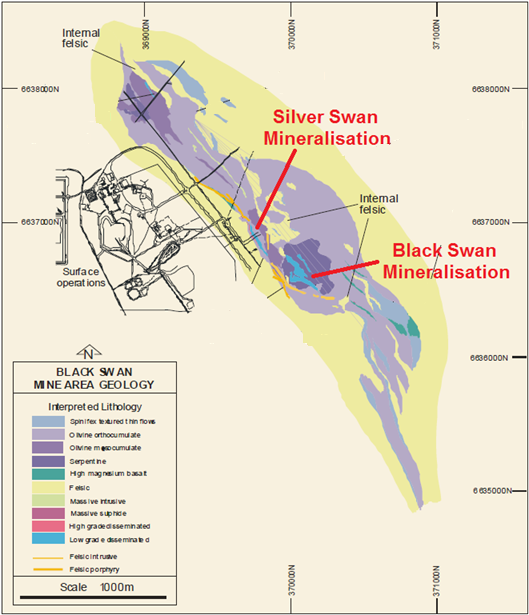 Mineralisation was first discovered in the Black Swan area during the nickel boom of the late 1960s. 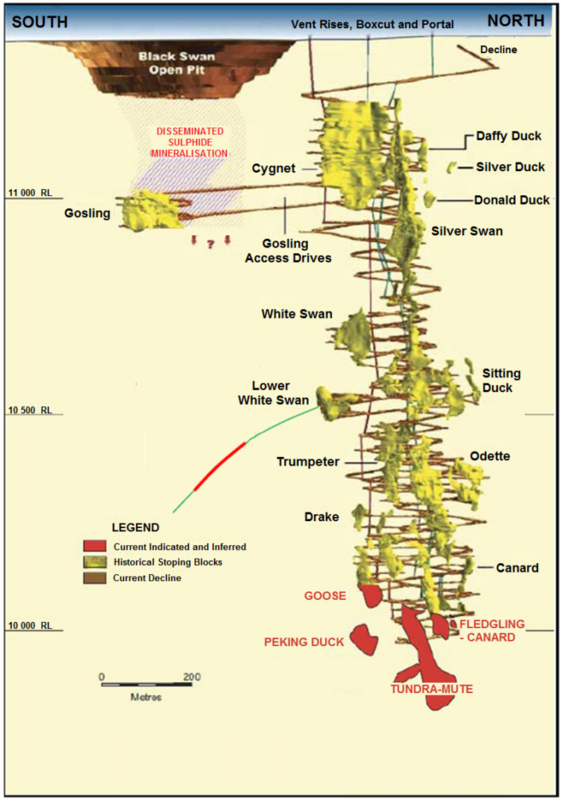 By 1972, drilling by Australian Anglo American Limited had defined a small nickel sulphide resource, what is now recognised as the Black Swan Disseminated orebody. However, after drilling a number of further exploration holes, Anglo halted the work and relinquished the leases. No further significant exploration was undertaken until in 1995 the tenements were acquired by a joint venture between MPI Mines Limited and Outokumpu Exploration Ventures Pty Limited. Exploration drilling commenced and the Silver Swan Massive sulphide deposit was discovered by the second drill hole. Over the next two years the White Swan, Cygnet and Gosling deposits were also discovered and evaluated. 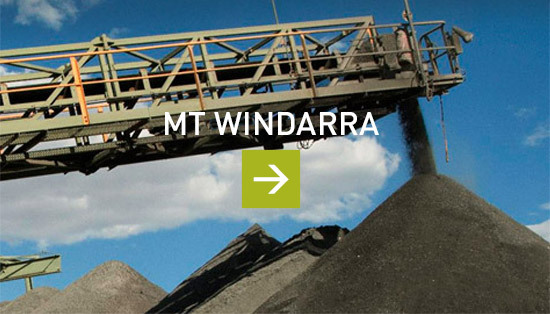 Surface construction work commenced in 1996 and the first ore from underground was brought to the surface in May 1997, two years after the first drill hole was commenced. Approval to excavate the Black Swan open pit was given in December 2003, with the pre-strip commencing in February 2004. The first ore was mined from the pit in May 2004. 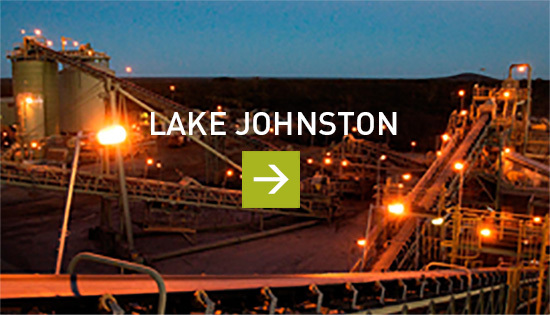 In November 2004 LionOre Australia (Nickel) Limited acquired the BSN operation through the acquisition of MPI Mines. In 2007 LionOre was subsequently acquired by the Norilsk Nickel Group of companies. The Silver Swan underground mine, the Black Swan open pit and the processing plant were placed into care and maintenance in February 2009 by Norilsk as a result of low nickel prices. Poseidon Nickel subsequently purchased the BSN Operation from Norilsk in late 2014 with a view to restarting mining activities. Mineralisation at Black Swan occurs within the complex as massive, semi massive and disseminated nickel sulphides developed on and adjacent to the basal contact. 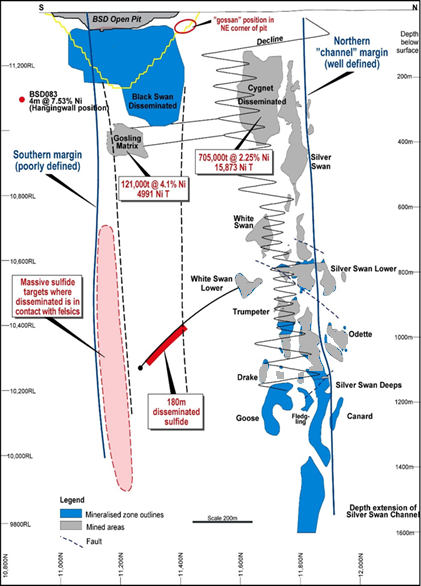 The Silver Swan massive-sulphide nickel deposit consists of a series of steeply dipping lens-shaped shoots of mineralisation situated on the basal contact of the Komatiite Complex. Individual shoots include Silver Swan, White Swan, Goose, Fledgling, Canard, Odette, Trumpeter and Mute Swan. This mineralisation plunges steeply towards the north along the southern flank of a substrate topographical high, the Silver Swan footwall dome. The Gosling orebody rests directly on the Gosling felsic unit, a discrete lens shaped sequence of dacitic breccias enclosed within the Komatiite Complex to the south of the Silver Swan mineralisation. It consists of semi massive, coarse blebby, matrix, and disseminated sulphide mineralisation. This is immediately overlain by the Cygnet and Black Swan disseminated horizons. Two disseminated sulphide deposits, Cygnet and Black Swan, are recognised within the Komatiite Complex. Both are located within an 800 m long zone of disseminated sulphide mineralisation that extends from near the southern end of the complex to Silver Swan in the north. All of these orebodies have been partially mined. In 2015 Poseidon completed an extensive data compilation and validation process to ensure all historical drilling, sampling, spatial and geophysical data was captured, collated and validated. Significant amounts of diamond core were also reviewed to verify and validate historical logging and interpretation. Holes with missing samples were resampled by Poseidon and submitted for assaying. Thus, holes that were previously removed from the estimation process were now validated and included. Considerable time was taken to accurately model the base of the Silver Swan komatiite flow, resulting in a clear delineation of the thermally eroded channel which governs sulphide location. Significant untested potential remains at the base of the Silver Swan workings which requires testing. The Black Swan mineralisation contains both disseminated and massive sulphides. 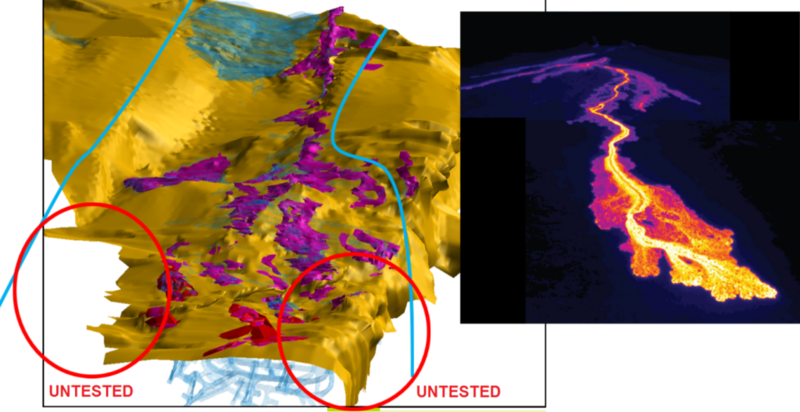 This provides significant exploration potential below the current pit as the drill density diminishes rapidly with depth. Lenses of massive sulphide similar to the Gosling Lode are probable along with significant tonnages of disseminated material. There is significant potential to extend the disseminated mineralisation resource down the Black Swan channel to depth. Deep drill holes have already intersected substantial thicknesses of disseminated mineralisation that may potentially be mined from underground.